Shape: Showing ample breadth, good dome, with greater length than width, the top to be much roomier than the bottom and more curved. The bottom should not be too pointed, and a circular, or even narrow shape is undesirable. The ideal shape is described as an elliptical cone. In outline it is an asymmetrical ellipse or Cassinian oval and a cross-section at any point across the egg’s girth is a perfect circle. This description is best shown by the large fowl egg. 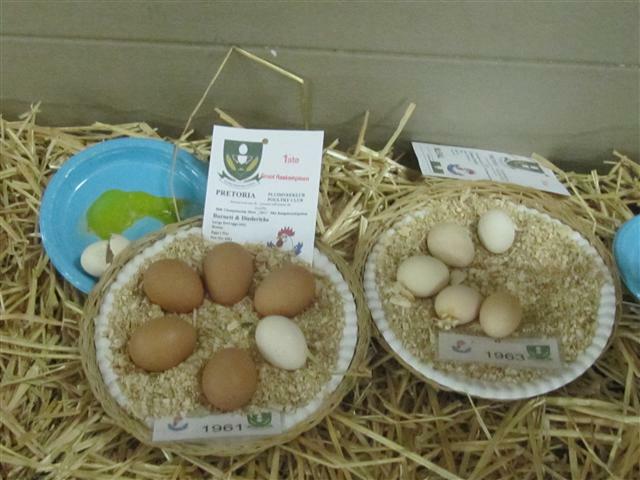 Pullet eggs are less pointed whereas some breeds of bantams characteristically lay more pointed eggs. Turkeys, ducks and geese are distinct species and each lays eggs of slightly different shape. Hence, they should be shown in their own classes. Turkey eggs are quite short and conical. Duck eggs are slightly elongated and those of bantam ducks tend to be pointed. Geese lay eggs which are lacking for girth and narrow towards the pointed end. Size: Mere size is not a deciding point but should be appropriate for the breed and species. Several factors influence the size of an egg. The major factor is the age of the hen. As the hen ages, her eggs increase in size. The breed of hen from which the egg comes is a second factor. Mass of the bird is another. 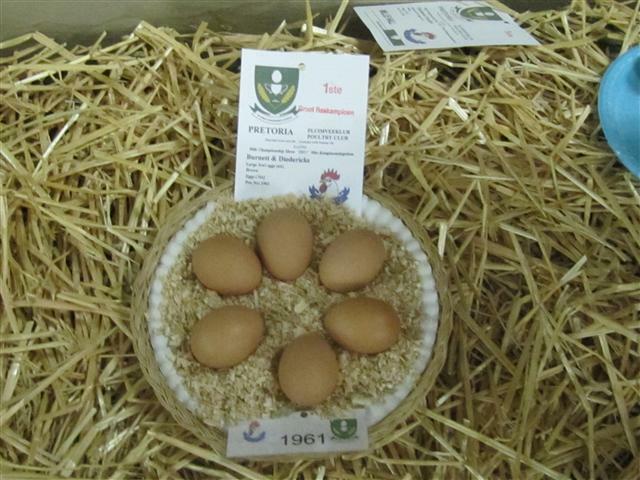 Pullets significantly underweight at sexual maturity will produce small eggs. Environmental factors that lower egg weights are heat, stress, overcrowding and poor nutrition. A pullet’s normal egg when the bird starts to lay is 49.6g and increases quickly to 56.7g, exceeding that after several months of production. There is another increase in the hen egg after the moult. Bantam eggs should be judged to the same standard as for large fowl eggs with the exception of size which should ideally not exceed 42.5g. Eggs weighing in excess of this weight should be discouraged or passed. Turkey and duck eggs weigh between 70.9g and 92.2g. Bantam duck eggs should not exceed 63.8g. Goose eggs vary with breed. Light geese lay eggs from 141.8g and heavy breed goose eggs can weigh up to 198.6g. Shell texture: The egg’s outer covering, accounting for about 9% to 12% of its total weight depending on egg size. The shell is the egg’s first line of defence against bacterial contamination. The shell is largely composed of calcium carbonate (about 94%) with small amounts of magnesium carbonate, calcium phosphate and other organic matter, including protein. The shell strength is greatly influenced by the minerals and vitamins in the hen’s diet, particularly calcium, phosphorus, manganese and vitamin D. If the diet is deficient in calcium, for instance, the hen will produce a thin or soft-shelled egg or possibly an egg with no shell at all. Occasionally an egg may be prematurely expelled from the uterus due to injury or excitement. In this case the shell has not had time to completely formed. Shell thickness is also related to egg size which, in turn, is related to the hen’s age. As the hen ages, egg size increases. The same amount of shell material which covers a smaller egg must be stretched to cover a larger one, hence the shell is thinner. Seven to seventy thousand tiny pores are distributed over the shell surface, a greater number at the large end. As the egg ages, these tiny holes permit moisture and carbon dioxide to move out and air to move in to form the air cell. The shell is covered with a protective coating called the cuticle or bloom. By blocking the pores, the cuticle helps to preserve freshness and prevent microbial contamination of the contents. The shell should be smooth, free from lines or bulges, evenly limed, smooth at each end of the egg, without roughness, porous parts or lime pimples. Colour: Brown, tinted, white, cream, mottled, blue, green, olive, plum, etc. The colour comes from pigments in the outer layer of the shell and the breed of hen determines the colour of the shell. The colour should be even and in the case of mottled or speckled eggs regular mottles or speckles are preferred. Mottled or speckled eggs are shown according to their ground colour. Freshness, bloom and appearance: Shells to be clean, without dull or stale appearance; airspace to be small, as befits a new-laid egg. Shell surfaces may be shiny or matt, but should be free from blemishes such as stains and nest marks. Eggs may be washed in preparation but not polished. In duck eggs the position of the air space can be apparent. This is not considered a fault. Muscovy duck eggs often have a wax cuticle which may be removed. Uniformity: The entry must consist out of six eggs. Eggs forming a plate or exhibit, to be uniform in shape, shell grade, shell texture, size and colour. Yolk: The yolk or yellow portion makes up about 33% of the liquid weight of the egg. It contains all of the fat in the egg and little less than half of the protein. With the exception of riboflavin and niacin, the yolk contains a higher proportion of the egg’s vitamins than the white. All of the egg’s vitamins A, D and E are in the yolk. Egg yolks are one of the few foods naturally containing vitamin D. The yolk also contains more phosphorous, manganese, iron, iodine, copper and calcium than the white, and it contains all of the zinc, The yolk of a Large egg contains about 59 calories. Double yolked eggs are often produced by young hens whose egg production cycles are not yet completely synchronised. They’re often produced, too, by hens who are old enough to produce ExtraLarge eggs, Genetics is a factor, also. Occasionally a hen will produce double yolked eggs throughout her egg laying career. It is rare, but not unusual, for a young hen to produce an egg with no yolk at all. Sometimes there is a greenish ring around hard-cooked eggs yolks. It is the result of sulphur and iron compounds in the egg reacting at the surface of the yolk. Occasionally several concentric green rings may be seen in hard-cooked egg yolks. A yolk develops within the hen in rings. Iron in the hen’s feed or water as the rings are formed may cause this colouring. The yolk colour depends on the diet of the hen, but should be rich bright golden yellow, free from blood streaks or spots. Well rounded smooth on surface, and well raised from the albumen. One uniform shade. Blastoderm or germ spot should not be discoloured. Albumen: Also known as egg white. Albumen accounts for most of an egg’s liquid weight, about 67%. It contains more than half the egg’s total protein, niacin, riboflavin, chlorine, magnesium, potassium, sodium and sulphur. The albumen consists of four alternating layers of thick and thin consistencies. From the yolk outward, they are designated as the inner thick or chalaziferous white, the inner thin white the outer thick white and the outer thin white. Egg white tends to thin out as an egg ages because its protein changes character. That is why fresh eggs sit up tall and firm in the pan while older ones tend to spread out. Preferably white in colour, of dense substance, particularly around the yolk, which it raises. Outline of albumen to be seen. Free of blood spots. Chalazae: Each chalazae to resemble a thick cord of white albumen at each end of the yolk, keeping it in the centre of the first or thickest albumen (white). Free of blood spots. Other layers of albumen less dense. Germinal Disc: The entrance of the latebra, the channel leading to the centre of the yolk. The Germinal disc is barely noticeable as a slight depression on the surface of the yolk. When the egg is fertilised, sperm enter by way of the germinal disc, travel to the centre and a chick embryo starts to form. Shell Membrane: Just inside the shell are two shell membranes, inner and outer. After the egg is laid and it begins to cool, an air cell forms between these two layers at the large end of the egg. Airspace: The empty space between the white and shell at the large end of the egg. When the egg is first laid, it is warm. As it cools, the contents contract and the inner shell membrane separates from the outer shell membrane to form the air cell. As the egg ages, moisture and carbon dioxide leave through the pores of the shell, air enters to replace them and the air cell becomes larger. Although the air cell usually forms in the large end of the egg, it occasionally moves freely toward the uppermost point of the egg as the egg is rotated. It is the called a free floating air cell. If the main air cell ruptures, resulting in one or more small separate air bubbles floating beneath the main air cell, it is known a bubbly air cell. For exhibiting purposes the air space should be very small, as befits a new-laid egg, the membrane still adhering to shell. Freshness: Indicated by small airspace, and unwrinkled top surface of yolk, and its height. Stale yolks flop at edges and as an egg ages the white becomes more runny. More than one yolk. Staleness. Polished or over prepared shells. Addition of colouring to shells. Large fowl eggs less than 340,2g to the six eggs. Bantam eggs more than 255g to the six eggs. Great lack of uniformity. Dirty or soiled eggs. Poor shell texture. Blood or meat spots. Mould growth and cracks. Defective contents even when judged for externals.